There have been numerous films about the process of filmmaking, but how often have cineastes paid homage to the act of film viewing? Granted, there is little that is particularly cinematic, or narratively exciting, about a group of people sitting in the dark for two hours. However, with all the experiences lived there (who doesn’t have an anecdote or memory of something they experienced in a movie theatre?) and all the awe and inspiration the giant silver screen can arouse in people, surely cinema-going is as valid a topic as any human activity? The Cannes Film Festival-originated omnibus project The Each His Own Cinema (Chacun son cinéma, 2007) was one such attempt, consisting entirely of short episodes set among the rows and aisles, with results ranging from Takeshi Kitano’s giddy tale of a bumbling projectionist to David Cronenberg’s disturbing At the Suicide of the Last Jew in the World in the Last Cinema in the World. 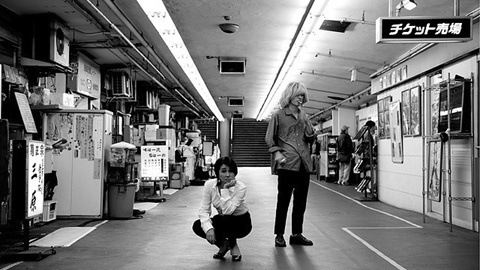 Naofumi Higuchi’s The Intermission proves that a feature-length story set entirely in and around a film theatre can provide rich cinema indeed. And what a film theatre it was... The Cinepathos was located alongside a plethora of unpretentious bars and eateries in what was generously termed Miharabashi Underground City, a tunnel under Harumi-dori, the central thoroughfare that traverses otherwise glitzy Ginza. Its three screens boasted a program that combined revival screenings of films from yesteryear, the latest V-cinema actioners on their obligatory one-screen theatrical release and generic U.S. genre fare starring the likes of Steven Seagal. Some time after the devastating 2011 Tohoku earthquake, the authorities rather opaquely decreed that the pedestrian underpass, which survived the calamities entirely unscathed, had to be closed for safety reasons. Sic transit gloria mundi. 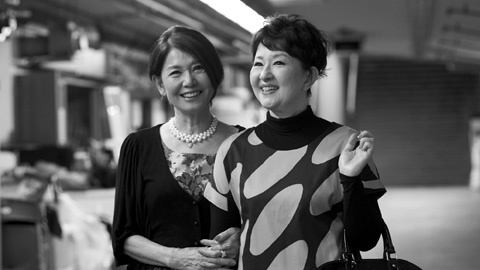 Although nothing could apparently be done to reverse the decision, film critic and curator Higuchi gathered a significant cross section of movie industry talent to pay homage to a film theatre that had been in active service since the late 1960s – and to the many things it represented and inspired. 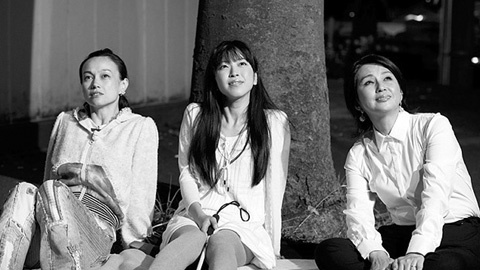 Doing more than offering pathos and reminiscence (though both are certainly contained in this quite remarkable film), The Intermission represents the theatre’s imminent closure as an allegory for the current state of Japan at large, still struggling with the consequences of the Tohoku earthquake and tsunami and haunted by the creeping shadow of radiation. The demolition of Cinepathos (and simultaneously the overall disappearance of Japan’s meigaza repertory cinemas) is also paralleled with the disappearance of film – the physical strips of celluloid – in the face of the digital onslaught, and on a broader political level with a general, and increasingly pervasive, denial of the past. It is much to the filmmakers’ credit that they avoided the all too obvious trap of waxing nostalgic about a glorious past, since this is exactly what the politicians offer in place of history. Recent attempts to replace history with nostalgia are not without their own distinctly ironic dimensions: many of Tokyo’s remaining meigaza were located in the Asakusa district, so representative of the shitamachi – the old, downtown Tokyo where, as Alex Zahlten described the area’s popular image, “the ‘real Japan’ is still preserved [...] and a degree of authenticity can be found”. In the last few years, the meigaza, genuine remnants of the city’s old quarters, have had to make way for a commercialised ‘rethink’ – a shitamachi theme park if you will – to coincide with the opening of the hoped-for tourist attraction just across the Sumida river, the Tokyo Skytree tower. Instead of nostalgia, Higuchi and his collaborators have opted for inquiry: inquiry into the state of a nation, into the state of cinema and cinephilia, and into the importance of history for our future. Inquiry of age and gender roles too: showing the Cinepathos as more than just “that smelly old place for leftist geezers”, The Intermission presents the viewer with a cast that ranges from pre-teen to well past retirement age, headed by a lead couple consisting of a powerful older woman (1970s Nikkatsu sexpot Akiyoshi) and a much younger man (current indie darling Sometani at his most effeminate in a blond wig) as the married theatre proprietors. If the overarching motif of the theatre’s closing could be read as an allegory, then the goings-on in its seats, lobby and environs work as a microcosm: people fall in love, become friends, argue, separate, reunite, eat, drink, live and even die there. “A film theatre is a good place to start a family,” as one of the many celebrity guest stars puts it. “Films are like constellations,” says another, giving a far more accurate description of The Intermission’s structure and nature as a film than the more obvious adjective “episodic” could ever convey. This is a film consisting of vignettes, certainly, but there is a glue here, there are ties that bind these characters and their stories. Cinepathos closed its doors at the end of March 2013, with Higuchi’s intelligent and freethinking film as the final title on its marquee. But it’s not all doom and gloom. This is the intermission, after all, not the end.